You guys, I feel really bad. 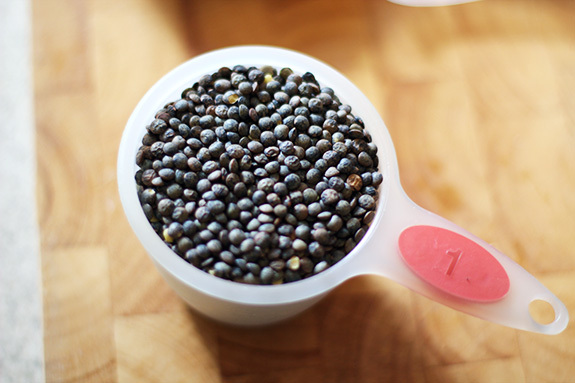 I gave you a recipe for spiced lentils and promised to give you the recipe for yellow rice to go with it, and some of you* went out and immediately made the lentils. Without the yellow rice. You need the yellow rice. So here it is, too late for yesterday’s dinner, but hopefully you liked it enough to try to again. And I’m sorry for depriving you earlier. 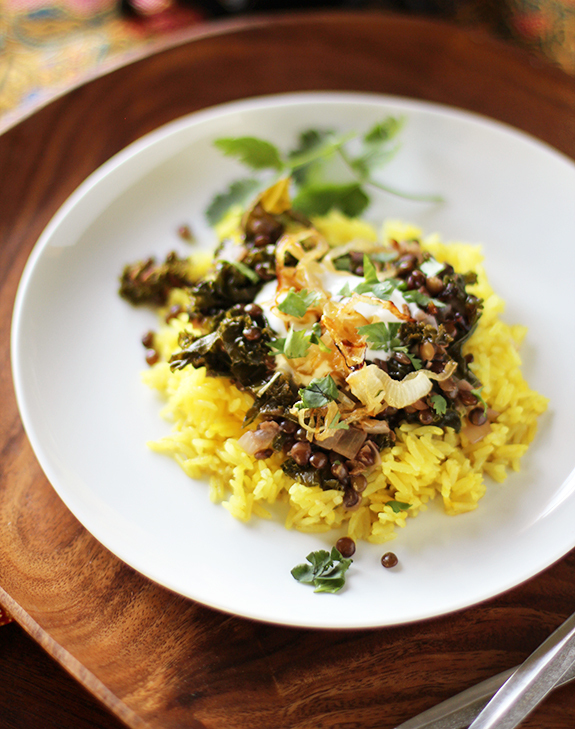 This rice recipe originally came from an Indian cookbook by Madhur Jaffrey that I bought at a thrift store many years ago. I think I picked it quite randomly, but it it so good, I’ve made it at least once a month ever since. Though the recipe is Indian, the rice also goes well with Mexican-style food, so I sometimes top it with cumin-spiced black beans and salsa, or put it in burritos. To make it even more international, I make it with Thai jasmine rice, since that is the white rice I always happen to have on hand. I’ve thought about trying it with brown rice, but haven’t yet gotten around to it. With white rice, it takes all of 20 minutes to make, the rice bubbling in a pot with a cinnamon stick, a few whole cloves, a bay leaf and some bright yellow turmeric. 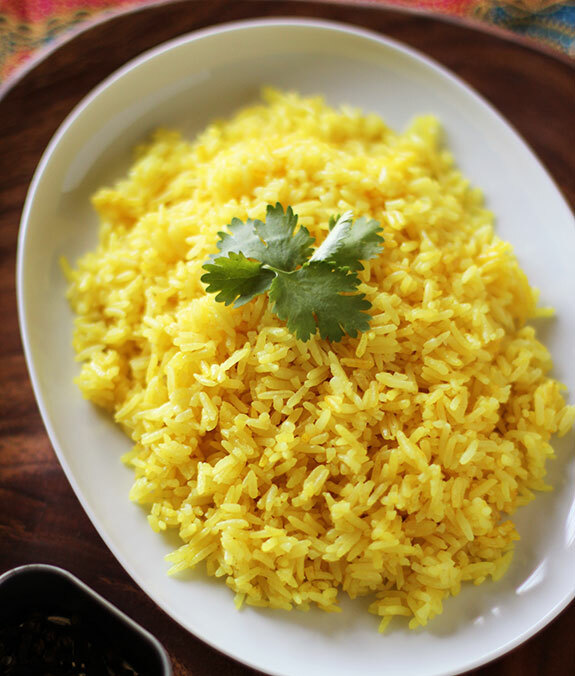 After steaming, a little butter gets stirred in — you can use olive oil to make it vegan, but I strongly encourage the use of butter if possible — and you have a fragrant pot of bright yellow rice that is so much more than just plain rice. Now go make some lentils and yellow rice already. * At least three of you. I think that officially makes mujadarah the most popular recipe on this site. I knew it was special. As I mentioned before, with the end of my full-time job and the approach of my first day of school (tomorrow! ), I’ve been fixated on frugal meals that can be made in bulk and frozen in portions, for those nights when I’m too busy or tired to think about cooking. I know that the words “frugal,” “bulk” and “frozen” don’t usually connote deliciousness, but an exception can be made for mujadarah. 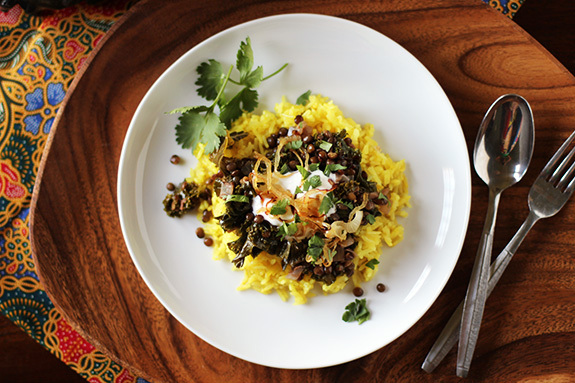 It’s not much to look at, but this Middle Eastern dish of spiced lentils and rice is total comfort food: warm, fragrant and full of yummy bits and pieces like crispy caramelized onion, fresh herbs and yogurt. There are a million different versions of the dish — and a million different spellings, try mujaddara, mejadra, mujadarra… — and mine is, well, mine. I claim no authenticity. For one thing I cook the rice separately from the lentils, which isn’t normal. But the rice I always serve it with is spiced on its own, with turmeric, cinnamon and cloves, and has to be cooked in its own pot. And the rice recipe is Indian, totally not normal. I also like to throw in a bunch of kale or other greens to cook along with the lentils, so that the finished dish is a full meal with enough vegetables that I don’t have to bother with making a side dish. Not normal. But more nutritious and I think even tastier. I’ve been making my particular mujadarah for the past six or seven years, probably about once a month. I often make it for one, sometimes I make it for little, casual dinner parties and once I made it, to rave reviews, for a group of ten on New Year’s Day. 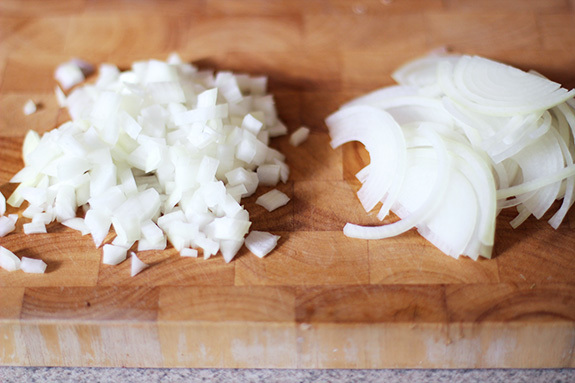 There aren’t many recipes with the same claim to fame. It may be frugal and freezable and perfect for making in bulk, but it’s special all the same. In two weeks I start graduate school. 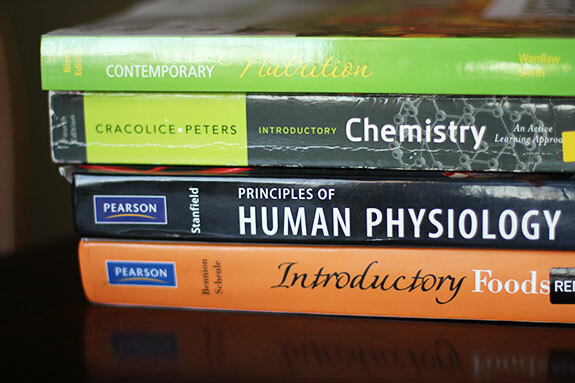 If all goes according to plan, I’ll be graduating from California State University Northridge in a few years* with an MS in Nutritional Science and all the classes I need to take the exam to become a registered dietitian. It’s exciting and a little scary, especially because I’ll be leaving my job as a personal chef to focus on school, which means a lot of belt-tightening and cable-canceling and frugal-meal-planning around here. So maybe it’s more than a little scary. But mostly it’s exciting, because as Rob can attest, I spent many anguished years wondering what I wanted to do with my life, once I realized that a film school degree didn’t take me anywhere I wanted to go, and food writing was probably never going to pay the bills. I considered becoming a grant-writer, a post-production sound editor, an online English tutor. I thought about culinary school or an MFA in Creative Writing. Getting an internship always somehow sounded like a good idea. It never was. Remember when kale leaves were just decorative accents in between the bowls in a salad bar? Nobody ate them. Sometimes they were even fake. 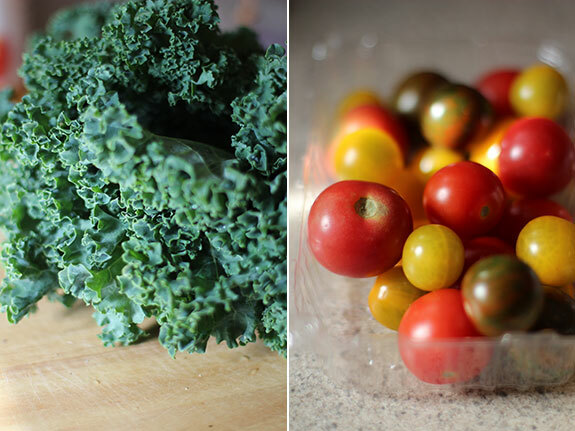 But then — perhaps in a fit of monotonous midwinter vegetable insanity — people started playing around with kale. Baking it into chips. Rubbing it raw with a lemony vinaigrette. Whizzing it into green smoothies. Falling in love. 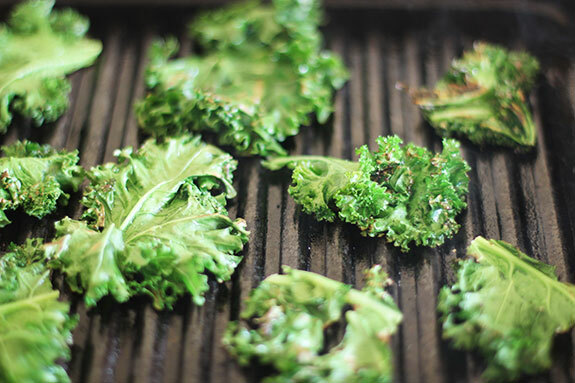 Now it’s time to jump on the bandwagon of the newest kale trend: grilled kale. 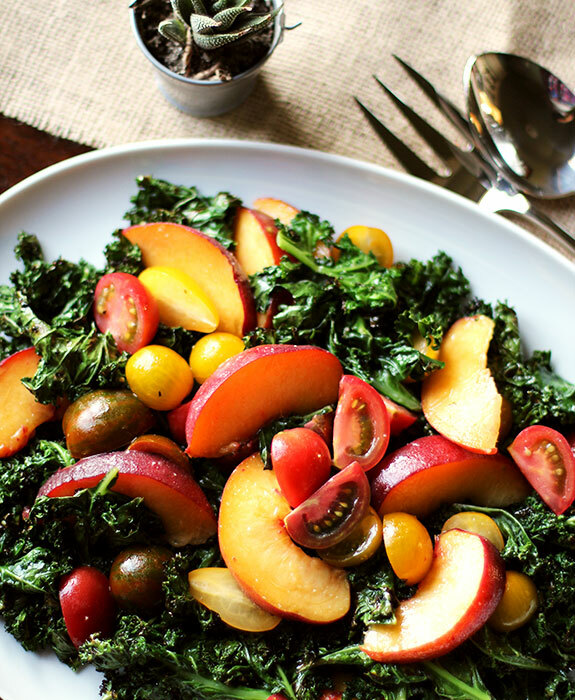 It’s summery, it’s smoky, it’s crispy and charred and tender and it’ll make you fall in love with kale all over again. Grilled kale leaves tossed with a little oil, salt and lemon or lime juice are addictive enough on their own, but the things you eat with your fingers while standing barefoot in the kitchen aren’t always what you want to bring to a dinner party. 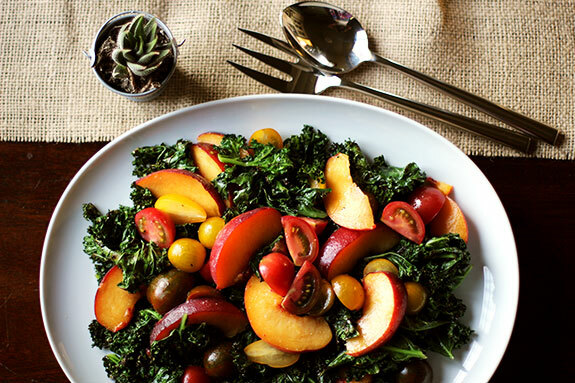 For that, you might want to add chunks of ripe peach, tart cherry tomatoes and a salty miso-lime dressing, which makes the plate of charred greens much more presentable and even more tasty. I grill my kale leaves on a grill pan, which gets very smoky; open up all the windows and turn on a fan if you go this route. On the plus side, you can cut the leaves into bite-size pieces before grilling without worrying about them falling through the grates. If you’re lucky enough to have an outdoor grill, use whole leaves and either cut them up after grilling, or plan on eating the salad with a knife and fork. This miso-lime-walnut oil dressing is one of my favorites for any type of grilled vegetable. It’s tart and salty in a way that complements the smokiness of grilled summer squash, scallions, carrots, anything really. It also magically makes peaches taste faintly like mango. Even if kale leaves you cold, give the dressing recipe a try. 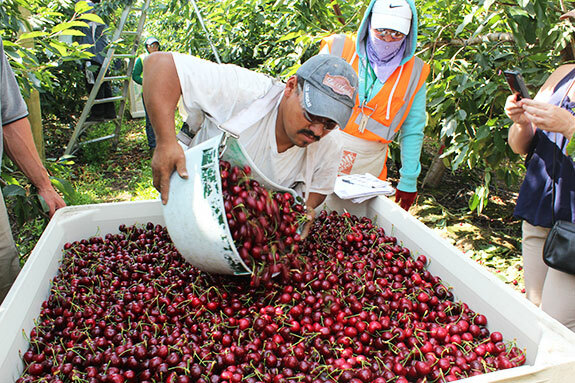 A couple weeks ago I went up to Yakima, WA to visit the fruit fields and cherry processing facility of Rainier Fruit Company. A cherry processing facility. Are you excited yet? You know that episode of The Simpsons where you see a glimpse of Milhouse having the time of his life at his dad’s cracker factory? It was kind of like that for this fruit-loving lady. Cherries are one of My Top 3 Fruits* and I learned so much during my day with Rainier, which I wrote about on The Kitchn earlier this week. I also ate the best cherries of my life, which I’m afraid have ruined me for all other cherries henceforth. I may need to move to Yakima. 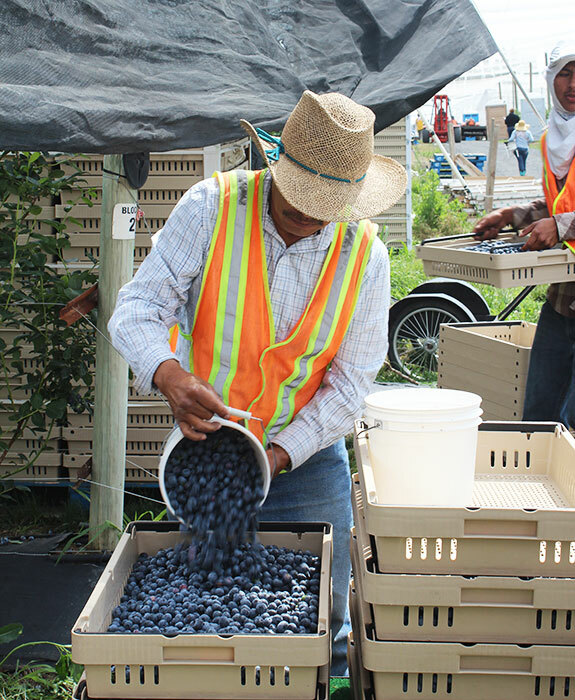 • During harvesting, the buckets the blueberries are put in never touch the ground, in order to avoid bacterial or fungal contamination. The pickers use special stands that keep the buckets off the ground. 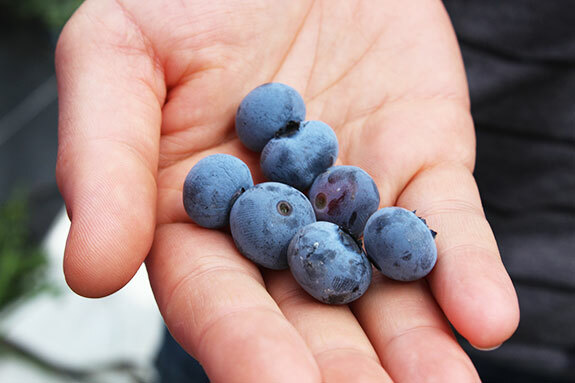 • The white “bloom” on blueberries help protect them from rot, and should not be washed off until just before eating. • Bees have to chew through the flower on blueberry bushes in order to pollinate them. Persistence! • A blueberry is ready to pick when you can pull it off the branch with just the slightest amount of pressure. 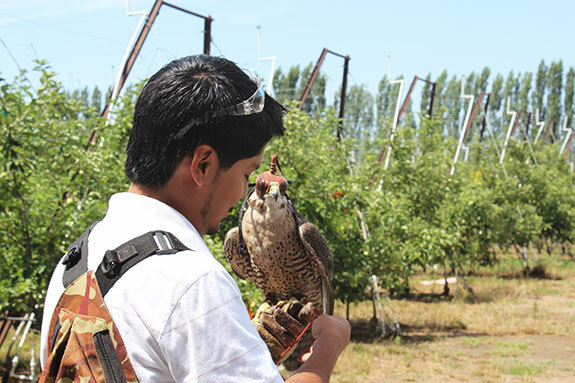 • Falcons help protect organic blueberry fields! Read more about that in my other post about the trip for The Kitchn. I totally want to take up falconing now. If all my travels involved really good fruit, sunshine and trained birds, I’d be a very happy person indeed. * …Peaches and mangoes, if you’re wondering.